1 How do I report a Bug? OpenSimulator is alpha software, this means that there are frequent bugs in the codebase, and many features that still need implementing. You can help us find and fix these problems by reporting bugs to us or submitting patches. The mantis tool is one of the main channels of communication between OpenSimulator users and OpenSimulator developers for purposes of reporting bugs. It is NOT a customer support tool, because there is no official customer support within the opensim project beyond that provided by volunteers in the opensim IRC and mailing list. It is also not a feedback tool like a forum. Please use assorted forums for that kind of discussion or contribution. If you want to use the mantis tool, you have to be willing to learn how Mantis is to be properly used in the OpenSimulator project, which is very different from other organizations' reporting & tracking systems. This explains how to generate and file a Mantis Bug Report, which really helps the continuous development of OpenSimulator. If your main interest is to have your problem solved, or send informal feedback, rather than help the development of OpenSim, then mantis is the wrong tool for you. Try signing on to #opensim IRC for that kind of help, where you can talk to other OpenSimulator users, exchange user experiences and get personalized volunteer help. If, however, you are willing to invest time to investigate the problem you are experiencing, your effort will be greatly appreciated. You should look at mantis as half-way between your effort to solve the problem and the developers effort to do the same (and fix the problem). For everything else, there are several IRC channels, mailing lists, and assorted grid-specific forums. Is there something broken in your setup? Look at the OpenSim.log file. Is there something informative in there that will help you understand what's going on with your setup? An exception perhaps? Can you reproduce the problem systematically? Take time to understand the steps that lead to the problem. The more reproducible and better understood the problem is, the higher the chances are that it will get fixed. If you can't reproduce it, there is very little chance that the issue will be fixed. But reproducibility to you is not enough. Read on. Can you describe the problem to developers so that they can reproduce it without being you? The best way to do this is to try to reproduce the problem in a standalone setup. This eliminates all the extra noise that adds fuzzyness to the issue. So try it in standalone first. If you are able to reproduce it like that, the chances of the problem being fixed soon increase dramatically. If the problem is related to the Hypergrid and distributed setups, try to reproduce the problem in only one machine with 2 opensim instances. From a developer's perspective, it will be easy to take your good description, reproduce it on their own standalones, and then fix it. If you can't reproduce it in standalone mode, try to reproduce it in grid mode using the simplest possible grid -- something that a developer can also set up on one machine without much work. If you can't reproduce it that way, and the problem only occurs within your special grid environment, chances are there's something wrong with your configuration or your special setup. Furthermore, the chances of a developer being able to fix the problem soon decreases dramatically. More than likely you will need to find volunteer technical support, or you may try to hire someone for a fee in order for him/her to take their time to investigate the issue with your grid. Remember, the purpose of your description is to help a developer experience the steps that lead to the problem, so that he/she can then fix it. - "TPs seem to be broken altogether with r1234, and lots of ppl are seeing this too": let the developers know about it in #opensim-dev, maybe. They probably already know. If all you can say about an issue is it's brief description or "This is happening to me, please help" or "Here's my informal feedback", Mantis is the wrong tool for it. Don't file a bug report, it will be closed promptly. Also, please do not propose features in Mantis, unless you also have accompanying code to implement said feature. The correct place to propose features is the opensim-dev mailing list in the first instance, and then the Feature Proposals wiki page. Visit opensimulator.org/mantis and search to see if your bug already exists in the system. If it does, please add a note with any additional comments or technical assistance such as steps to reproduce, symptoms, etc. Concise and to the point, IE: "Duplicating a primitive while sitting on it, crashes the region.". Contains as much debug information as possible, if OpenSimulator threw an error before crashing it, a copy of this error is helpful. If not, pasting the last 50 lines from your opensim.log when appropriate is also potentially helpful. If you can reproduce the bug, steps to reproducing it is a must. Please do not submit bugs such as "OpenSimulator eats a lot of CPU time" without including information about your setup, and anything you or we may have done to trigger this, unfortunately we are not psychic and cannot guess what may have happened. Create an account on the opensim Mantis website, and hit 'Report new issue'. Please note that some free email providers may take a while for the confirmation email to appear. One of the goals is to get as many issues out of the new state as possible and get turned into good bugs that can be acted upon. 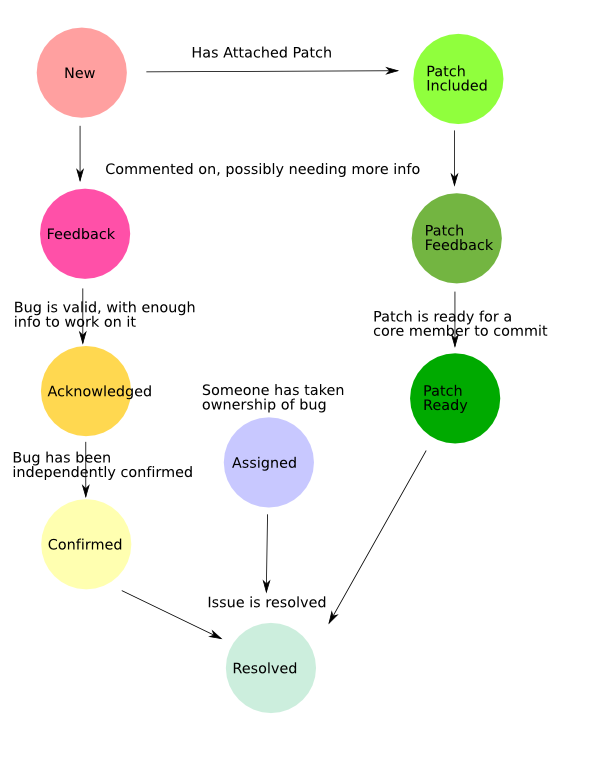 Below is a lightweight state diagram that should help in deciding what state is appropriate for bugs in Mantis. Bugs don't have to flow through all states to land somewhere. For instance, if a bug starts with a well written up description, and the person triaging the bug has seen the same issue, it can be moved straight to confirmed. As with everything, these are rough guidelines, use your judgement. A bug will be marked Resolved if the person working the bug believes it is fixed even if there isn't final confirmation from the reporter. If the reporter finds that it is not fixed, please just reopen the bug and add comments accordingly. Please leave closing of bugs to core team. A closed bug means we think it's gone forever, or the bug report is invalid. A bug in resolved or closed state can also be reopened if the bug still exists. Please read the bug report and the attached notes carefully before doing this. It will add source file names and line numbers to your stacktrace, which enables developers easily find the erroneous steps. This page was last modified on 3 March 2012, at 23:16. This page has been accessed 110,644 times.